The CIA is vowing to retaliate for the deaths of seven of its workers in Afghanistan. Reports suggest the suicide bomber infiltrated the very nerve center for the CIA in Afghanistan. The attack happened at a desolate U.S. base in Khost province, not far from the border with Pakistan. CNN's Atia Abawi in Afghanistan looks at the basic question: How did someone walk into this U.S. facility and blow himself up? Members of the U.S. military send out New Year greetings from Bagram Air Field to their family and friends, originally featured on AC360° with Anderson Cooper and Kathy Griffin. 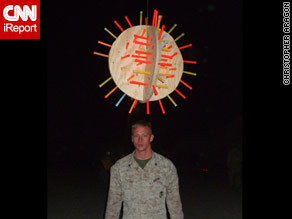 Meanwhile, troops at Camp Leatherneck Marine base in Afghanistan celebrated the new year with a ball drop of their own. An American intelligence official vowed Thursday that the United States would avenge a suspected terrorist attack on a U.S. base in Afghanistan that resulted in the deaths of seven CIA officers. "This attack will be avenged through successful, aggressive counterterrorism operations," the intelligence official vowed. Former CIA official Robert Richer called it "the greatest loss of life for the Central Intelligence Agency since the Beirut Embassy bombing" in 1983, which killed eight agents. Flags at CIA headquarters in Langley, Virginia, flew at half-staff Thursday. Update: 2:26 p.m. ET: The number of dead is now at least 75. Update: 1:07 p.m. ET: At least 60 are dead and 60 injured in the attacks. A suicide car bomb exploded Friday in the middle of a group of men playing volleyball in northwest Pakistan, killing 30 and wounding 52, district police officials told CNN. The terror attack happened in a residential neighborhood in the Lakki Marwat district of Pakistan's North West Frontier Province, police said. Some of the casualties were residents from houses around the volleyball court, district police Chief Mohammed Ayub Khan told CNN.